In the 1960s, a portion of a ditch excavated into chalk bedrock west of the henge at Stonehenge was discovered during construction for the pedestrian underpass that provided access to Stonehenge until a year ago. 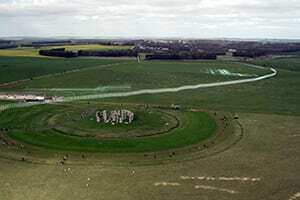 By 2014, geophysical testing confirmed that the ditch stretches over 900 meters (2952.7 ft.) from southwest of the Stonehenge henge to a point near the south ditch line of the Greater Cursus, northwest of Stonehenge. The ditch is generally oriented SW-NE and nearly straight for much of its length, before it curves counter clockwise toward the northwest as it approaches the ditch of the cursus. It has a V-shaped cross section about 1.2 m (3.9 ft.) wide and 1.3 m (4.3 ft.) deep. Discovery of the location and size of the ditch was a surprise in itself, but what became more curious was the finding of large diameter post holes along the bottom of the ditch for its entire length. The post holes ranging from about 0.25 to 0.4 meters (0.8 – 1.3 ft.) in depth, such that the depths of the post holes are as much as 1.7 meters (5.6 ft.) below the ground surface. The width and depth of the post holes has led archaeologists to conclude the posts must have attained a height of about 6 to 7 meters, or roughly 20 feet. Archaeologists have found similar structures elsewhere, concluding they are remnants of palisades each consisting of tall wooden posts set to form an alignment, the purpose of which often remains unknown. There is one other fact that remains curious about the ditch adjoining Stonehenge. Its SW-NE alignment terminates in Stonehenge Bottom about 2 m (6.6 ft.) from the west ditch of the Stonehenge Avenue before making its left-hand turn toward the cursus. Thus, there appears to be an intentional geographical arrangement between the Palisade, Avenue, Greater Cursus, and Stonehenge itself. Archaeologists consider alignments of large post holes along ditch-ways to be remnants of palisades – fences or walls constructed of timber posts often but not always used as a defensive structure. Like stone tools, bone pins and clay jars, palisades are artifacts of ancient cultures except in this particular case we have a massive artifact nearly a kilometer (0.6 mile) in length and with most of its original composition weathered away. It is an artifact of a prehistoric culture, and an enigma. Palisades were built by many cultures throughout time and around the world. The conclusion that the Stonehenge Palisade was a massive fence 6 meters (20 ft.) tall was the result of estimating its height by the size of the postholes along its length. The buried portion of a fence post is typically about 25 to 30 percent of the total length of the post. With a post hole extending 1.7 meters (5.6 ft.) below ground surface, the post may well have stood about 5.5 – 6.7 meters (18 – 22 ft.) above ground. Given the sacred nature of the Neolithic and Bronze Age Stonehenge landscape, archaeologists conclude the reason for constructing such a massive fence alongside Stonehenge must have been related to whatever ritual activities were being performed inside the henge. The fence must have been built to prevent direct physical and visual access to Stonehenge from the west. 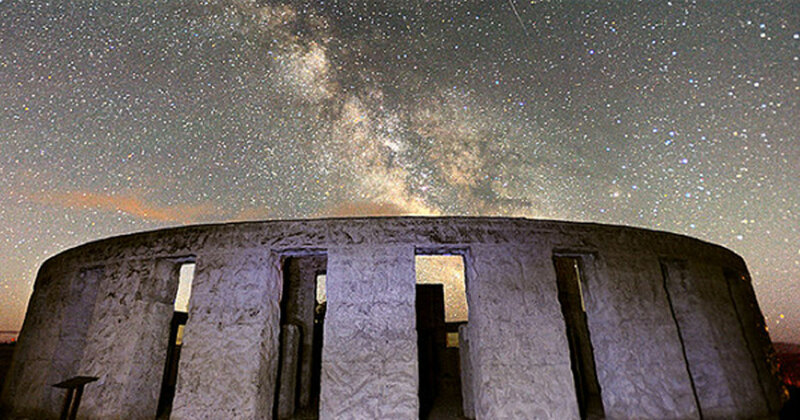 That is a strange conclusion to make given the architecture of Stonehenge is well known to be related directly to the four cardinal directions (including due west and due North), as well as the northwestern direction of sunset on the evening of summer solstice. The 6.1 meter (20 ft.) high wall proposed for the palisade would have prevented views toward two of the four cardinal directions and one of the most important solar events of the year. People northwest of Stonehenge might have been prevented from looking into Stonehenge, but those inside the henge would have been unable to experience events held sacred toward the north, northwest, and west. Why would such a structure have been built and re-built over the course of hundreds of years, beginning shortly after construction of megalithic Stonehenge ca. 2500 BC? Simply put, all evidence we have supporting our current understanding of the purpose of Stonehenge and its sacred landscape does not support the theory of the Palisade as a massive wall. So, if not a palisade, then what was it? In 2014, I proposed a Grand Design was constructed across the Stonehenge Sacred Landscape (Burley, 2014). The design was the product of translocating the asterism known as the Winter Hexagon onto Salisbury Plain. The accurately surveyed and positioned structure remains in place on the landscape with specific monuments representing stars. It extends from the top of Larkhill to Normandy Down, and from Durrington to the new Stonehenge Visitor Centre. All archaeological evidence gathered to date from across Salisbury Plain supports the theory that this Grand Design was indeed designed and built across the landscape. The Winter Hexagon was believed by many Neolithic cultures – Sumerians, Egyptians, Chinese, Maya, and others – to be the cosmic womb and source of the spirit of life in the universe. The constellation of Orion is situated within the hexagon. Contemporary with culture(s) which built Stonehenge and the Palisade, Pre-dynastic and Early Dynastic Egypt believed Orion represented Osiris, psycho pomp of the dead in the Duat, receiver and protector of the spirit of each pharaoh. The pharaoh’s spirit travelled from Earth to Orion via spirit road, the Milky Way from Sirius to Capella. Included within the Winter Hexagon on Salisbury Plain is Orion. Alnitak, one of the three stars of Orion’s Belt, is represented by the Heel Stone at Stonehenge, the megalith adjoining the womb of Earth represented by the henge and iconic stone structure. The Greater Cursus represents the Milky Way between the star Sirius (west end of the cursus) and ecliptic (long barrow Amesbury 42) where the path of the sun intersects the galactic plane. Farther east, Woodhenge represents the star Capella in the constellation of Auriga, the shepherd. The book ‘Stonehenge: As Above, So Below’ (2014, New Generation Publishing, London) details the planning, design, construction and use of the Grand Design at Stonehenge. During or soon after construction of megalithic Stonehenge, the Avenue was built between the Heel Stone and River Avon to the east. As demonstrated in the book, by about 2480 BC the Grand Design included the Avenue as a representation of Orion’s right arm reaching out to receive the body of the dead as it was brought to land after being floated down river from Durrington Walls. Upon the Stonehenge landscape is Orion – overlord of the spirit world – prepared to receive not only the body along the Avenue to Stonehenge, but the spirit of the dead via the spirit path represented by the Greater Cursus, from Sirius to Capella. The scenario parallels the ancient Egyptian understandings. The body remains with Mother Earth, the spirit returning to the sky and Orion. Importantly, these constructions occurred during the mid- to late Neolithic, and early Bronze Age. Hunting and gathering was replaced rapidly by agriculture and domestication of animals. Far more ancient religions and sacred lifeways were evolving to incorporate Neolithic culture, applying the Neolithic ‘tool kit’ to create amazing architectural structures such as the pyramids of Egypt and more to the point, Stonehenge and its associated landscape. By 2500 BC, most of the massive monuments were in place on Salisbury Plain. One of the last few to be built was Stonehenge Palisade. It was constructed nearly a thousand years after the Greater Cursus and symbolic Winter Hexagon, and not long after the Avenue (Orion’s arm) reached out from Stonehenge to accept the dead. The Neolithic cultural revolution was complete. Agricultural activities dominated the region. Grain had become a stable in the diet. One of the most important tools used by early Bronze Age farmers was the scythe. The blade could be held and operated in hand, or a wooden handle was attached to the blade, allowing the user greater reach and improved efficiency of harvest. It was a dangerous tool to use, slicing through the crop with ease. It is no wonder Celtic myth employed the scythe as the weapon of choice in the metaphor of ripe grain as the mature king of life, sacrificed at first harvest so that the people could survive another winter before new life returned the following spring. Comparing the Bronze Age scythe with handle shown in the second image with a plan view of the Stonehenge landscape including the Palisade, we see immediately that the shape of the Palisade accurately reflects the shape of the implement. The constellation of Orion is shown upon the landscale, scaled per the size and orientation of the constellation’s right arm extending eastward as the west portion of the Avenue. The symbolism expressed on the ground – the Sky God, psycho pomp, protector of the spirit of life, set within his cosmic domain– with scythe placed at Orion’s side is in keeping with what we know of late Neolithic and early Bronze Age agrarian life in central south England. The scythe was an appropriate addition to the monuments that were constructed across the landscape over the previous 1000 years. It represented the annual harvesting of life sustaining grain for both human and animal consumption. It was the implement of choice in a ritual killing of the King, sacrifice of the old in favor of the new. Indeed, the reaper of grain is the reaper of death, and this was the Sky god’s calling. Orion, protector of the spirit of life, was also the receiver of the dead. The body was received and interred to the earth goddess from whence it came, while the spirit was provided means to travel back to its source in the cosmos, at Orion’s side. Symbols of cosmic Orion, overlord of Stonehenge, and his scythe remain on Salisbury Plain. The Celtic festival of Lughnassadh provided means for the people to participate in one of the important events in the cycle of life, events that were deemed vital enough to be forever carved symbolically as artifacts coverings the Stonehenge Sacred Landscape. The Stonehenge Palisade is but one of many. Whether it was built over 6 meters (20 ft.) tall or finished to the grade of the adjoining ground surface, the symbolism is clear. Previous Post: Did Jesus of Nazareth Travel to the Far East?